Check out this small waterfront park for wading birds like Snowy and Reddish Egrets and shorebirds such as Black-bellied Plovers feeding on the flats and in the shallows of the Anclote River. Wood Storks and Anhingas drop in at times, and American White Pelicans and Red Knots are sometimes found in winter. Visitors will enjoy Royal, Sandwich and Forster’s Terns, plus Brown Pelicans and Belted Kingfishers plunging for their meals. Ospreys and Bald Eagles nest nearby, as have Great Horned Owls in past years. Fallouts during migration occasionally produce songbirds like Tennessee Warblers; scan the oaks around the picnic areas. Lucky viewers may spy sea turtles and dolphins drifting by on occasion. This site has a popular beach and a multi-lane boat launch that tend to be busy on weekends, so come early, or on a weekday for the best wildlife viewing experience. 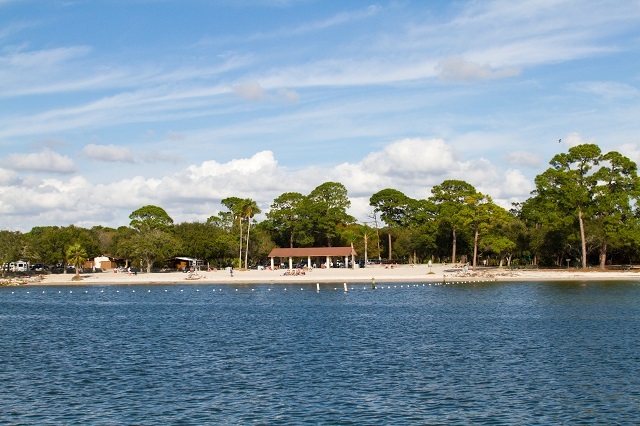 Be sure to make time to visit Anclote Gulf Park to the north as well.